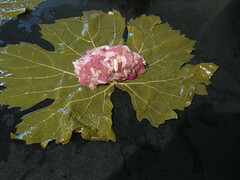 Our October 2010 hostess, Lori of Lori’s Lipsmacking Goodness, has challenged The Daring Cooks to stuff grape leaves. Lori chose a recipe from Aromas of Aleppo and a recipe from The New Book of Middle Eastern Food. Of course, in my normal fashion, I decided to not use the recipes provided but to make one up and just use the guidelines for the wrapping and cooking. I’ve never made dolmas before, so this was a fun one to just make up as I went. However, I did pay attention to the cooking directions, though not quite as well as I should have…. I pulled out the grape leaves and started them soaking to remove the brine (and I totally should have done this first, duh). I bought a big jar that had 4 rolls of grape leaves and I only used one roll for my little recipe. I also had some difficulty getting them to unfurl from their packaging rolling. I kept patiently teasing them though because I didn’t want to rip them all to shreds. Patience. I let them sit for about 20 minutes and then did three or four rinses. I left them sitting in the bowl of fresh water and cleared my rolling space. The rolling went very smoothly and quickly. I had a few leaves that had gotten ripped in the unrolling process, so I set those aside and picked out good, whole leaves. Once I had the leaf laid out flat on the counter, it was a simple matter of grabbing a few tablespoons of filling in my hand, squished into a roll-ish shape, then plopping that at the base of the leaf and rolling it up. Pulling the sides in as I rolled was easy and they packaged up quite nicely for me. Much easier than I thought it might be. After the first two I sped quickly through the rest. This is definitely something about making dolmas that lends itself to a group of folks hanging out in the kitchen with some wine or beer, rolling dolmas, and chatting to pass the time. Time to cook these lil guys up. I took a few of the set-aside ripped grape leaves and lined the bottom of good-sized pot. I then put the dolmas in the pot, nicely snugged together to form an even layer. I then cut up half of a lemon into thick slices and wedged those, and garlic cloves, into any gaps to help keep things tightly packed. I added water carefully, so as to not dislodge a dolma, to not quite cover them and added lemon juice and some salt. A big thing about making these is to keep them from floating apart, so I had the bottom of a springform pan taht fit nicely in my pot and then I set a bowl over top to weight it down. I brought the water up to a boil and then leveled it off at simmer. Now, I need to mention that the stove in my new flat is a crazy, professional-style stove, and that thing burns hot and h3, even on the small burner. Things were cooking along wonderfully, just bubbling away. There seemedto be plenty of water, but it was hard to see since my weight system pretty much made it so I could see anything underneath. To make a long story short, I ended up burning the dolmas beyond repair. The water boiled out and they burned lickity-split. Damn! But it sure smell good before they burned. So, no final pic. This was fun process and, though a little bit of work on the rolling, not as tedious and more worth the making of the pierogis a while back. I’ll definitely give this another go. And maybe next time I won’t burn my dinner. Who knows if this recipe tastes good at all, but I’m putting the recipe as I cooked it because I’m going to do these again. 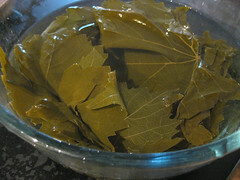 Remove grape leaves from the jar and gently unfurl them. Put them in a bowl of hot (boiled) water and them them soak for about 20 minutes. Drain the water off and rinse through with fresh water a few times, then fill the bowl with cool water and leave them be until you are ready to roll. 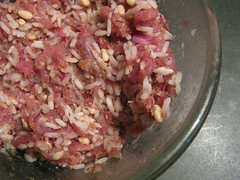 Mix all of the ingredients from the lamb to the salt and pepper in a bowl. Pull out a grape leaf and get it flat on the counter. Snip off any aggressive stem it may have popping out. Set aside any leaves that are ripped up or have wholes in them. Grab about 2 tablespoons of filling and form it into a cylinder shape. Place it towards the base of the leaf. Roll forward one roll, then bring in the sides of the leaf and continue rolling. Go through all of your filling. Place a few leaves in the bottom of your pot (the set-asides are perfect for that). I just sized up a pot that would fit the dolmas snugly, either in one or two layers. Layer the dolmas into the pot trying to make them as snug as possible. For gaps, cut the lemon into thick slices or chunks and wedge them in where needed. I also added a few garlic cloves as wedges. 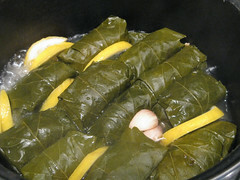 Gently pour water into the pot just to the top of the dolmas, add a squeeze of lemon juice and some salt. This is really for taste, so do what you want to flavor the “broth.” You’ll need some way to keep the dolmas from floating while cooking. Any heat-proof dish with a flat-ish bottom that fits in your pot will do (I really wished I had my Pyrex 4-cup measure with me). Put that on top and bring the water to a boil, then reduce to a simmer. Keep an eye on the water level and top up with hot water if it is boiling down. Cook for about 40 minutes, then remove from the water. Serve hot with some minted yogurt.